• Robust & durable case. • Tested and warranted in Australia. • 15 year warranty on the titanium component of the heat exchanger. • 1 year warranty on evaporator, refrigeration components, compressor and heat exchanger. • 1 year warranty on case. Ready to talk to Habitat? Habitat Heat Pumps can be the answer to all your needs about pool heat pumps. 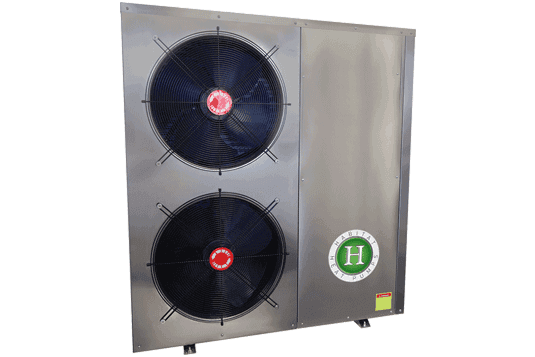 Whether you are looking for cheap heat pumps in Brisbane or cheap heat pumps in Gold Coast, Habitat Heat Pumps provides a wide array of choices for pool heat pumps in Brisbane or pool heat pumps in Gold Coast. Some companies offer you different pool heat pump prices in Queensland and different pool heat pump prices in Gold Coast. But our company offers you the same pool heat pump prices everywhere in Australia based on our website’s online price. Our heat pump pool heater prices range from $1,930 up to $5,556, depending on the size. But rest assured that all the Habitat Heat Pumps products are tested and warranted in Australia. In short, all our pool heat pumps are quality-assured. All our products have a 15-year warranty on the titanium component of the heat exchanger. Our cheap heat pumps are cased with quality and durable material and come with a 1-year warranty for the casing. We also offer different sizes of pool heat pumps to cater to different pool sizes. Among the positive heat pumps for pools reviews that you can read about Habitat Heat Pumps is that “it is a great product at a great price”. Most of our products are rated 5 stars out of 5 stars, according to different online pool heater reviews. Our company also offers you installation services from our professional and experienced installers. Aside from that, our services do not only limit to installation but technical advice as well as part of our customer care. Our technical and professional staff will give you proper instruction as to how to take care of your pool heat pumps to make them last to almost a lifetime. All our pool heat pumps come with a 1-year warranty on evaporator, refrigeration components, compressor and heat exchanger. Habitat Heat Pumps is an Australian-owned company that caters to different kinds and of the highest quality pool heat pumps. It has been serving the pool heat pump consumers for more than 37 long years. You can contact us on Constance Street, Bowen Hills, Brisbane QLD 4006, or through phone# 1300 150 732 or email us at info@habitatheatpumps.com.au.